Dr. Michael Sumsion dedicates a significant portion of his practice to helping patients with diabetes and diabetic retinopathy protect their vision. Often, the results of routine eye exams are the first indicator that an individual may have diabetes, and in those cases, Dr. Sumsion recommends that patients immediately contact a physician for testing. If you have already been diagnosed with diabetes but have not had an eye exam in a while, Dr. Sumsion invites you to schedule your routine eye exam today to assess your vision and protect your eyes. Ophthalmologist Michael Sumsion, MD offers TECNIS® Symfony IOLs to help cataract surgery patients achieve clearer vision and increased independence from glasses. Redding, CA – As a board-certified ophthalmologist with years of experience in laser vision correction and cataract surgery, Redding eye surgeon Michael Sumsion, MD is enthusiastic about recent developments in intraocular lens implant technology. At his practice, Riverside EyeCare Professionals, Dr. Sumsion is now offering the latest addition to the TECNIS® family of IOLs: the TECNIS® Symfony lens. According to Dr. Sumsion, Symfony® is the first ever extended depth of focus lens on the market. What sets Symfony® IOLs apart, he explains, is that they deliver continuous high-quality vision at near, intermediate, and far distances for cataract surgery patients. Reduction in visual aberrations, such as halos and glare, which can be a concern with some types of traditional multifocal lenses. Clearer vision over an extended range of distances and at any time of day. Uninterrupted transition between focal points at various distances. Independence from or reduced reliance upon glasses. He also points out that Symfony® is available in a toric version for patients with astigmatism. Symfony® has proven to be a very popular option among those who have received the lenses during cataract surgery, says Dr. Sumsion. Clinical studies have reported rates of satisfaction as high as 97%, with patients claiming they would choose to have the lens implanted again. He encourages individuals who are considering cataract surgery to explore all of their IOL options with their surgeon and ask about whether or not TECNIS® Symfony lenses may be right for them. Board-certified ophthalmologist Michael Sumsion, MD has been practicing in Redding since 1990, and opened Riverside EyeCare Professionals in 1997. In his more than 20 years of experience, he has treated a variety of eye conditions with state-of-the-art technology, advanced techniques, and innovative procedures. At his practice, Dr. Sumsion offers a wide variety of treatments and services, including cataract surgery, LASIK laser vision correction, glaucoma treatment, and corneal transplants. He is an active member of several prominent professional organizations, including the American Medical Association, the American Society of Cataract and Refractive Surgery, and the American Academy of Ophthalmology. Dr. Sumsion is available for interview upon request. For more information about Dr. Sumsion and Riverside EyeCare Professionals, please visit recp-eyemd.com. Not a good candidate for LASIK? Dr. Michael Sumsion offers PRK surgery as an effective LASIK alternative to reduce dependency on glasses and contact lenses. Redding, CA – According to Dr. Michael Sumsion, LASIK surgery is the most popular form of vision correction surgery among his ophthalmology patients at Riverside EyeCare Professionals. However, due to the technique used during the procedure, not all patients are ideal candidates for LASIK. Thankfully, these patients can still significantly improve their vision with PRK surgery or other alternatives to LASIK. “For some patients, LASIK alternatives such as PRK may be better suited for their individual needs,” says Dr. Sumsion. During the LASIK procedure, a corneal flap is created, giving the surgeon access to reshape the cornea and correct conditions including nearsightedness and farsightedness. Patients who do not have an adequate corneal thickness for this flap creation are generally not considered good candidates for LASIK surgery. With PRK, the cornea can be reshaped without the need for a corneal flap. In addition, this FDA-approved method of vision correction surgery has given patients improved vision since 1995—longer than LASIK. “While LASIK tends to be the most popular vision correction surgery, it is certainly not the only effective option,” says Dr. Sumsion. Many of Dr. Sumsion’s patients who are not ideal candidates for LASIK have enjoyed successful results with PRK and now live without depending on glasses or contact lenses to see clearly. According to Dr. Sumsion, a consultation with a board-certified ophthalmologist is the best way to determine which vision correction surgery can meet the unique needs of the patient. With a thorough eye exam, a comprehensive review of the patient’s medical history, and a discussion of the patient’s individual goals, he says the surgeon can create a customized treatment plan for optimal results. Dr. Sumsion is a board-certified ophthalmologist and has been practicing in Redding, CA since 1990. Specializing in the treatment of a wide variety of eye conditions – including cataracts, nearsightedness, farsightedness, and dry eye – he uses state-of-the-art technology and techniques to achieve long-lasting results. Dr. Sumsion also specializes in vision correction surgery, including cataract surgery, LASIK laser vision correction, PRK, and Refractive Lens Exchange. He currently serves as an active member the American Medical Association, the American Academy of Ophthalmology, and the American Society of Cataract and Refractive Surgery. 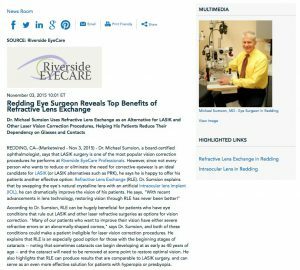 Dr. Michael Sumsion uses Refractive Lens Exchange as an alternative for LASIK and other laser vision correction procedures, helping his patients reduce their dependency on glasses and contacts. According to Dr. Sumsion, RLE can be hugely beneficial for patients who have eye conditions that rule out LASIK and other laser refractive surgeries as options for vision correction. “Many of our patients who want to improve their vision have either severe refractive errors or an abnormally-shaped cornea,” says Dr. Sumsion, and both of these conditions could make a patient ineligible for laser vision correction procedures. He explains that RLE is an especially good option for those with the beginning stages of cataracts — noting that sometimes cataracts can begin developing at as early as 40 years of age — and the cataract will need to be removed at some point to restore optimal vision. He also highlights that RLE can produce results that are comparable to LASIK surgery, and can serve as an even more effective solution for patients with hyperopia or presbyopia. 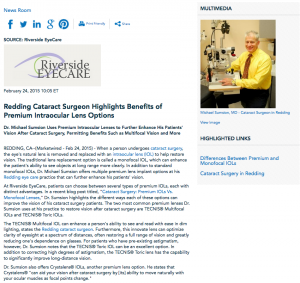 As an added benefit, Dr. Sumsion says that RLE can be especially advantageous for patients with cataracts. “RLE can often be performed in conjunction with cataract surgery, allowing your board-certified Ophthalmologist to remove the cataract while also correcting other vision impairments,” says the Redding cataract surgeon. In addition, Dr. Sumsion notes that lens implants can eliminate a patient’s risk for developing cataracts in the future. Michael Sumsion, MD of Riverside EyeCare Professionals highlights various qualifications that typically make one a good candidate for LASIK surgery. 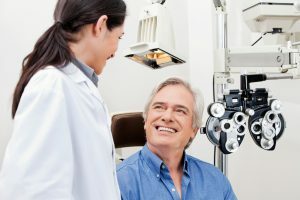 Redding, CA — For decades, LASIK surgery has proved to be an excellent option for many individuals seeking to enhance the quality of their vision while decreasing or even eliminating their dependence on corrective eyewear, states Dr. Michael Sumsion, a LASIK and cataract surgeon in Redding, CA. In fact, he says this popular refractive laser surgery has significantly improved conditions such as astigmatism, nearsightedness, and farsightedness for numerous patients at Riverside EyeCare Professionals, often helping them achieve 20/20 vision. Following surgery – which involves careful reshaping of the cornea via precision laser energy – Dr. Sumsion explains that some temporary blurry vision, light sensitivity, and excessive watering of the eyes may be possible side effects. For this reason, he says patients may need to take the rest of the day off from work and/or other normal activities, which should also be factored into determining candidacy. Dr. Sumsion is a Board-Certified Ophthalmologist who has served the Redding, CA community for more than 20 years. After earning his medical degree from the University of Utah Medical School, he went on to complete his residency in Ophthalmology at the world-renowned Mayo Clinic. At Riverside EyeCare Professionals, Dr. Sumsion offers an expansive array of treatments and services ranging from LASIK and cataract surgery to PRK, refractive lens exchange, and corneal transplants. He remains at the forefront of innovation in the eye care industry by maintaining active membership in the American Society of Cataract and Refractive Surgery, the American Academy of Ophthalmology, and other esteemed medical organizations. For more information, visit recp-eyemd.com. Dr. Sumsion is available for interview upon request. Dr. Michael Sumsion uses advanced IOLs that not only replace lenses affected by cataracts but can also improve vision impairments including nearsightedness and farsightedness. Redding, CA – Although cataracts are a common eye condition that can severely impact one’s vision, cataract surgery is the only quick and effective method of cataract removal. As eye care technologies have advanced, board-certified ophthalmologists have been able to prevent permanent cataract damage through innovative surgical means while simultaneously correcting refractive errors such as nearsightedness or farsightedness. Dr. Michael Sumsion, a LASIK and cataract surgeon in Redding, has made cataract surgery one of the focuses of his practice. As a result, he has helped thousands of patients remove their cataracts, become less dependent on corrective eyewear, and ultimately improve their quality of vision. “If left untreated, cataracts can seriously damage the quality of your vision and even lead to blindness,” says Dr. Sumsion in a recent blog post titled “Restoring Your Vision With Cataract Surgery.” Since this common condition can more effectively be treated in its earliest stages, he suggests visiting a board-certified ophthalmologist as soon as cataract symptoms develop. Prompt treatment is considered the best way to prevent cataracts from advancing and causing permanent vision loss, he notes. The benefits of cataract surgery can include the prevention of serious vision impairment as well as correcting pre-existing refractive errors. The goal of cataract surgery is to restore daily functional vision. Dr. Sumsion says his cataract surgery patients typically report very minimal discomfort associated with the procedure and often return to their normal activities within one to two days. After surgery, he adds that his patients can often enjoy a reduced dependency on corrective eyewear and clearer vision. Dr. Sumsion is a board-certified Ophthalmologist and has been practicing in Redding since 1990. His experience has equipped him to treat a variety of eye conditions with state-of-the-art techniques, including cataract surgery and LASIK laser vision correction. Dr. Sumsion is a member of several national professional organizations, including the American Society of Cataract and Refractive Surgery, the American Academy of Ophthalmology, and the American Medical Association. Dr. Michael Sumsion uses premium intraocular lenses to further enhance his patients’ vision after cataract surgery, permitting benefits such as multifocal vision and more. Redding, CA – When a person undergoes cataract surgery, the eye’s natural lens is removed and replaced with an intraocular lens (IOL) to help restore vision. The traditional lens replacement option is called a monofocal IOL, which can enhance the patient’s ability to see objects at long range more clearly. In addition to standard monofocal IOLs, Dr. Michael Sumsion offers multiple premium lens implant options at his Redding eye care practice that can further enhance his patients’ vision. 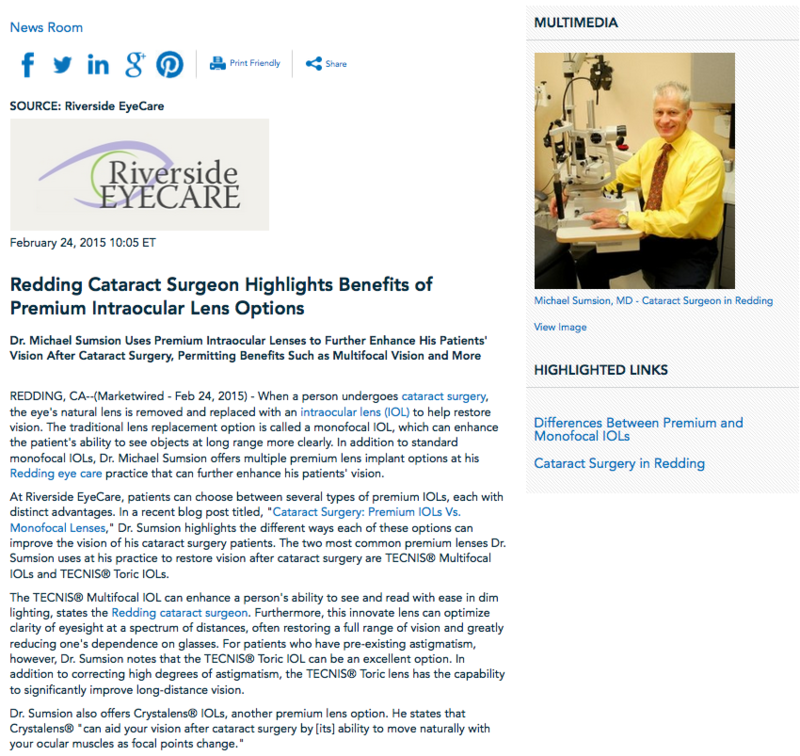 At Riverside EyeCare, patients can choose between several types of premium IOLs, each with distinct advantages. In a recent blog post titled, “Cataract Surgery: Premium IOLs Vs. Monofocal Lenses,” Dr. Sumsion highlights the different ways each of these options can improve the vision of his cataract surgery patients. The two most common premium lenses Dr. Sumsion uses at his practice to restore vision after cataract surgery are TECNIS® Multifocal IOLs and TECNIS® Toric IOLs. The TECNIS® Multifocal IOL can enhance a person’s ability to see and read with ease in dim lighting, states the Redding cataract surgeon. Furthermore, this innovate lens can optimize clarity of eyesight at a spectrum of distances, often restoring a full range of vision and greatly reducing one’s dependence on glasses. For patients who have pre-existing astigmatism, however, Dr. Sumsion notes that the TECNIS® Toric IOL can be an excellent option. In addition to correcting high degrees of astigmatism, the TECNIS® Toric lens has the capability to significantly improve long-distance vision. Following cataract surgery, Dr. Sumsion states patients often experience dramatically clearer vision the day after their procedure. As the eyes continue to heal, he adds, the vision of the patient should continue to improve. To help each patient decide which type of IOL is best for their individual circumstances, Dr. Sumsion conducts one-on-one consultations with his patients. Monofocal lenses or one of Riverside EyeCare’s premium IOLs will be recommended depending upon each patient’s unique vision needs. Dr. Sumsion is a board-certified ophthalmologist and a member of several prestigious medical organizations, including the American Academy of Ophthalmology and the American Society of Cataract and Refractive Surgery. He offers treatments for a variety of eye conditions, as well as cataract surgery and LASIK laser vision correction. Dr. Sumsion has been practicing as an ophthalmologist in Redding since 1990. He is available for interview upon request. Dr. Michael Sumsion offers patients interested in LASIK laser eye surgery a complimentary consultation to determine candidacy for the procedure. Redding, CA — Many Americans choose to correct their vision with LASIK, reducing or even eliminating their dependence on corrective eyewear, says Dr. Michael Sumsion, a Board-Certified Ophthalmologist. As a courtesy, the Redding LASIK surgeon offers complimentary consultations at his practice, Riverside Eye Care, for anyone interested in the procedure. Dr. Sumsion stresses that the procedure might not be appropriate for all people, so determining candidacy through a consultation prior to surgery is important. “This is a big, life-changing decision for many people, so hopefully I can help make it a little easier on them.” Dr. Sumsion also notes that he can recommend alternative solutions for anyone who does not qualify as a candidate for the procedure. In a recent blog post announcing free LASIK consultations, Dr. Sumsion says his practice offers a unique difference for LASIK candidates. With an innovative process called iLASIK, he says he is able to perform the procedure without the use of a surgical blade. The all-laser device was developed to maximize patient comfort, as well as provide results that are as precise and accurate as possible. Using iLASIK with Wavefront™ technology, Dr. Sumsion explains he is able to map out the patient’s eye and create a 3D image, allowing him to create a personalized treatment plan for each of his patients. Once a treatment plan has been established, Dr. Sumsion says a corneal flap must be created in order for the cornea to be reshaped during the LASIK procedure. He notes that many other physicians use a blade for this process. According to Dr. Sumsion, a flap created with the blade-less IntraLase Method of iLASIK typically has less complications and greater stability than one created with a blade. In the final stage of LASIK, he says he uses a “cool” laser to reshape the patient’s cornea according to their customized treatment plan and correct refractive errors such as nearsightedness, farsightedness, and astigmatism. Dr. Sumsion encourages anyone in the Redding and Red Bluff area considering LASIK to contact his office and schedule a complimentary LASIK consultation. “I look forward to helping our community learn more about the procedure and discover if it is right for them,” he says. The practice also offers financing options through CareCredit® to help qualified applicants manage the cost of procedures. Welcome to the New Eye Care Website! 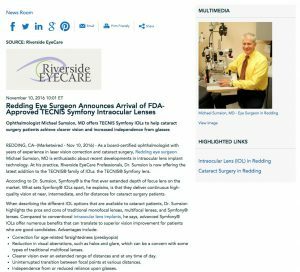 Dr. Michael Sumsion and his entire team at Riverside EyeCare would like to welcome you to the brand new website. Our goal in creating this site is to provide you with an overview of our care and provide basic answers to questions regarding the procedures we perform that range from LASIK to cataract surgery. We also hope to give provide an in-depth look at our practice, our office, our team, and the latest news and events. As you take a tour of the site and read up on the issues or concerns you have regarding your vision, we urge you to write down any questions and contact us to schedule a consultation. we look forward to hearing from you!